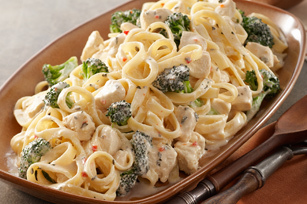 Our 3 step fettuccine alfredo is easy and delicious. You can't go wrong with a bowl full of fettuccini pasta, your favourite meat and veggie add-ins and a Parmesan cream sauce. MIX together cheese, butter and cream and heat until sauce is smooth. TOSS sauce with pasta, meat and vegetables.